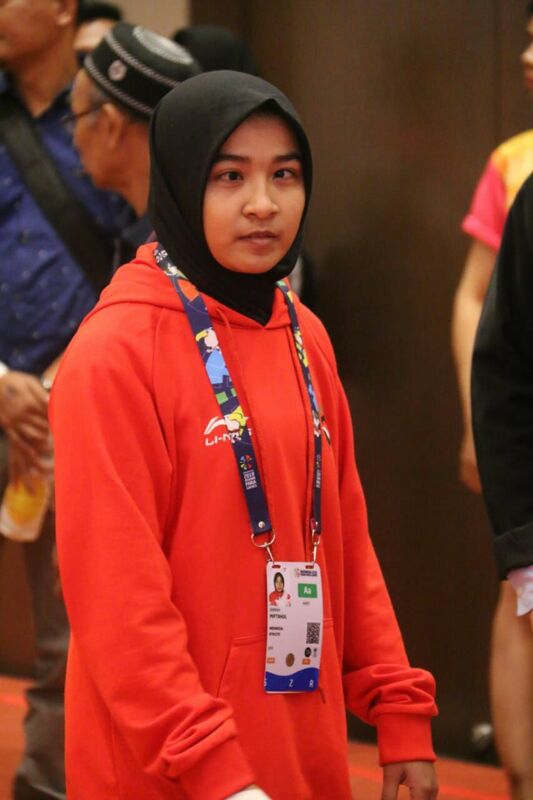 One of Indonesian representatives was disqualified from the class of 52 kg Blind Judo sport of low vision classification in Asian Para Games 2018 because she refused to remove the hijab. Her name is Miftahul Jannah. This 21-year-old woman is committed to her principal to not to remove the hijab. "Whatever the risk, I will not remove the hijab," said Miftah, yesterday (7/10). Strangely, based on information from Miftah's relatives, the provisions forbidding athletes from wearing the hijab were only decided yesterday, the result of a technical meeting held on Sunday (7/10). "It should be told in advance, or at least a week before," said Alam, a relative who accompanied Miftah on Monday (8/10). The President of the Indonesian National Paralympic Committee (NPC) Senny Marbun, who was tried to be contacted, was reluctant to comment further. "Wow, that's heavy. Very sensitive, Sir. Just ask the coach," Senny said. Latif, Blind Judo coach confirmed that the rules for banning the use of the new headscarf were decided yesterday. His efforts to fight for Miftah when attending a technical meeting so that he could still compete, did not make results. "This rule was only applied yesterday from the results of technical meetings," Latif said when contacted Monday (8/10). "We have tried to fight for it. Just the reason for this ban is due to safety factors. The heaviest punishment is disqualification," he continued. While based on the information obtained by Miftah, the ban on veils is because they are considered the same as shin guard. "Because the veil is considered as a protective device such as shin guard and so on," said Miftah. However, on Monday (8/10) Miftah continued to go to the arena. Unfortunately, the athlete born in Aceh Besar was disqualified by the referee. "Feeling sad, yes. Because 10 months passed a series of exercises until the hands can't move, crack. But the end result is like this (disqualified). IBSA's decision will not change again," said Miftah. She hopes, there are changes to the rules that allow athletes to wear hijab in Blind Judo sports. "Because this is privacy, covering the aurat is not prohibited. Hopefully this kind of occurrence in Indonesia can change much better than the present," he hoped. Despite of being an athlete with special needs, since childhood a large woman in Aceh Barat Daya has made many achievements. There are 13 champions in various sports at prestigious events, including first place in the O2SN Chess Sports Competition in Elementary School Elementary School in 2010. Second place in 2010 PKLK O2SN Chess Competition in Aceh Province Elementary School, 1st place in OS2N PKLK ABK Chess Sports Competition Education in Aceh Province in 2011, the fifth winner of the National PKLK O2SN PKLK Chess Sports in 2011, the first winner in the PKLK O2SN Chess Competition in Aceh Province Primary Education in 2012, and the sixth winner of the national O2SN PKLK ABK Catur Chess competition. In Bapernas, Miftah is also former chairperson of Aneuk Meutuah SMPLB student council and is also a former secretary and treasurer at the Bandung State SLBN_A Student Council (SD, SMP, SMA). He also won the 100M runner-up, 200m runner-up, 2012 long jump champion, national 2013 O2SN PKLK ABK champion, saty champion at Peparda Aceh in the 100, 200m and long jump in 2014. At Peparda Jabar, Miftah also won the first place in judo, 1st place in chess in Blind Ches, 2 in the classical chess championship, 1 chess chess winner, 3rd in chess in Regudan, 1st place in Spit Blind Chess chess in 2015. While at the national level, PON / PEPARNAS JABAR, Miftah was also recorded as the first winner of National Judo Blind Sports. In the APG (ASEAN PARALIMPIK GAME) event Malaysia Cabor Goolbol won 8th place in the 400m runner up, 1st place in Chess Sports and 3rd place in the 2017 Blind race. Not only in the field of sports, in academics, she was also the 1st winner of National PPKN OSN PKLK ABK National Intelligent in 2014, 2nd place was OSN PKLK ABK MiPA ACEH in 2010, 1st place OSN PKLK ABK meticulously MTK in 2011, OSN PKLK ABK meticulously national 201, OSN PKLK ABK nationally intelligent PPKN 2014, champion 2 ICT applied Jaws on national laptops in 2016, champion 1 ICT processed scientific informatics systems and created national literacy 2017.